Rob Wells comes from a family of killer doors and was always on the quest for large, quality doors that could add a “WOW” factor along with a pop of color to his eccentric home. 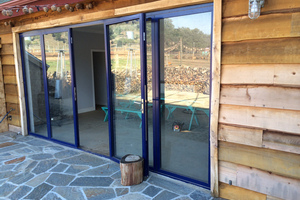 His grandfather owned “Clear View Corporation” which introduced Rob to large openings of glass and when he heard a friend talk about the glass folding out of site, he knew he had to have them – and so his quest began. Rob originally did not order NanaWall, dismissing them believing they were “too expensive”. 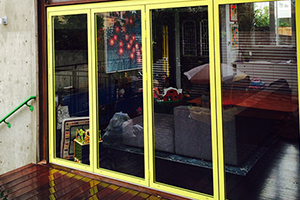 He ordered folding doors that sagged, did not have aluminum cladding and could not supply the crazy colors he wanted. When he ordered his first set of majestic violet NanaWall’s, his quest ended: Rob had found large glass doors that had aluminum cladding and could come in any color he wanted! The colored NanaWall’s now reside at his home, barn and office. 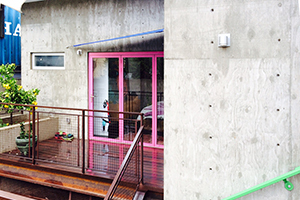 Rob’s home addition consists of two shipping containers cantilevered over his hot pink garage, welded together. It is a unique structure and the first of its kind in La Jolla! 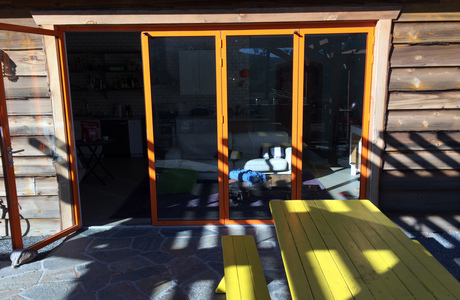 To make the shipping containers more inviting, he added deep orange and blue NanaWall’s that flood the rooms with light and color. The doors add that pop that he has been looking for.